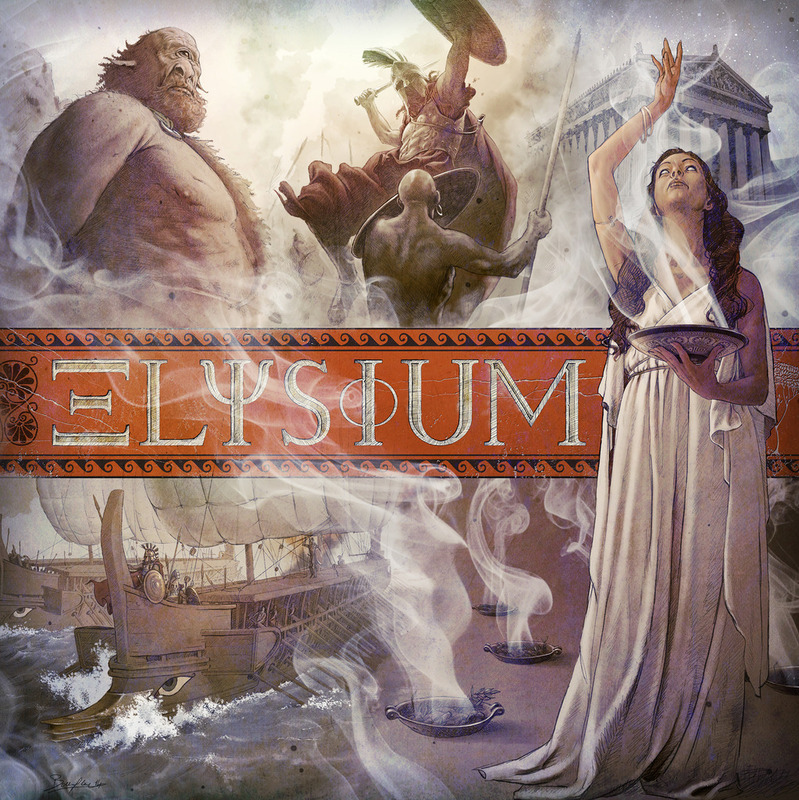 Elysium – Nobody can play just one! I propose a new classification of board games: nobody can play just one. It should be applied to games that you immediately want to play again, even after just finishing a game. I first remember experiencing this phenomena after losing a game of Pandemic. We all immediately wanted to play it again… and we did! It’s perfectly understandable, we lost and we wanted a chance to even the score. But later, when 7 Wonders was published, I experienced it again: players immediately asking for another play of the same game. The most recent game to earn nobody-can-play-just-one status is Splendor published by Space Cowboys and Asmodee. And now they’ve got a new game hitting U.S. shelves in May called Elysium which from all the reviews and player comments I’ve read so far, promises to be the next game to earn the status of nobody can play just one. Let’s take a look at it. 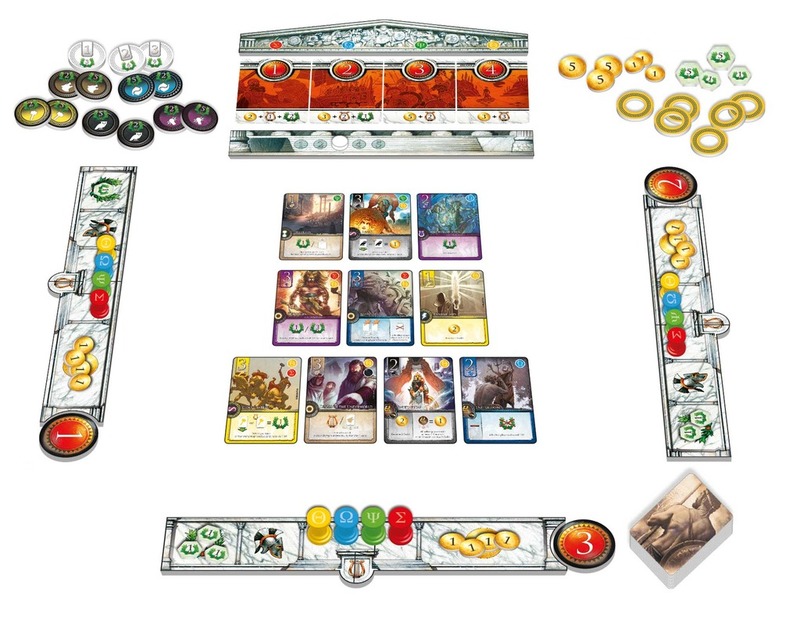 In Elysium, a game of set collecting and combinations set in mythic Greece, you take on the role of an upstart demigod, striving to claim a place at the summit of Mount Olympus by acquiring the favor of the gods (most victory points). To accomplish this, you’ll recruit heroes, acquire artifacts and powers (all cards) to your Domain, and undertake quests (play order tiles). Each card belongs to one of eight Families (gods), and has a Level (1 to 3). While in your Domain, your cards provide useful powers. During the five epochs (rounds) of the game, you’ll try to transfer cards you’ve acquired to your Elysium and write your own Legends to earn you victory points (VPs). Legends are Rummy-like sets of cards of either the same Family (think runs of 1, 2, 3) or from different Families of the same Level (think books: 1,1,1,1,1 or 3,3,3,3,3). The more epic the Legends, the more favor from the gods (VPs) you’ll earn. In fact, most of your VPs will come from the cards you transfer to your Elysium, though you can often earn points during the game, too, by utilizing the power of certain cards. Unfortunately, when you transfer cards to your Elysium, most of them lose their power. This presents constant dilemmas. Do you aim for Instantaneous and one-use Trigger cards that you can transfer easily once you’re done using them? 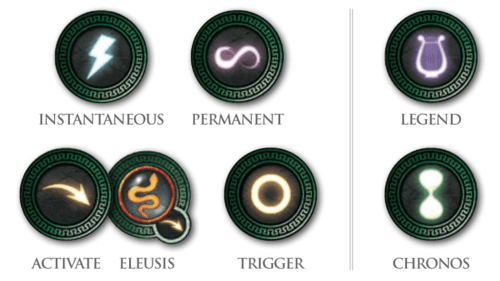 For Permanent and Activate cards you can use in multiple rounds? Or do you go after cards that earn major points at game end, but don’t help you build an engine during play? Or perhaps you should take a more balanced or tactical approach by making the best use of the opportunities presented as they come up. With new challenges and card combinations every game, I betcha can’t play just one. Let’s see how Elysium plays. Setup: Each player takes a player board, 4 gold, a play order Disc (randomly), a number of VP tokens equal to their play order Disc, and 4 columns colored red, yellow, green and blue. The rest of the setup is as pictured with the Quests framed by the Pediment (on top) and steps (beneath) to form a temple and the Oracle (if used) above the temple. 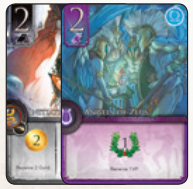 Turn up cards – 1 plus 3 times the number of players – to form the Agora below the temple. (Agora means market.) There are 5 Epochs (rounds) of 4 Phases each. Phase I: Awakening is simply a cleanup phase in which you remove any cards left in the Agora and draw new ones. Skip this step in Epoch I.
Instantaneous – invoke the power as soon as you acquire the card. Activate – you can use the power once per Epoch. Eleusis – you may only activate it if you have at least one other Eleusis card in your Domain. Permanent – always active as long as it’s in your Domain. Trigger – you can use it once during the game. Take a trigger token and place it on the card when you acquire it. Discard the token when activate the card or transfer it to your Elysium. During your four turns in Phase II, you’ll acquire exactly one Quest tile and three Family cards. Place the Family cards in your Domain (above your player board) and the Quest tile to the left of your board as you acquire them. If you can’t fulfill the Acquisition Condition of any remaining Family card and you don’t have three Family cards yet, you must instead take a Citizen: take the top card from the draw pile and place it face down in your Domain. If after taking your three cards, you still don’t have a Quest and don’t have the columns necessary to take one of the remaining Quests, then you must pass your turn. When all players have completed their turns, take one of the remaining Quests and flip it to its Incomplete Quest side. Phase III: Writing the Legends is when you can transfer cards to your Elysium and form sets for VPs. First reallocate the Discs according to the Quests taken by the players. This changes play order for the rest of the round. Players receive the Gold and Victory Points shown on their Quests. 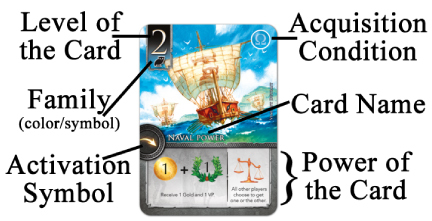 Then, in the new play order, players may transfer cards from their Domain to their Elysium (below their player board). Each transfer costs Gold equal to the card’s Level. The Lyre symbol on your Quest indicates how many cards you can transfer. You can also use Permanent and Legend card powers (of cards in your Domain) during Phase III. When you transfer a card to your Elysium, you must decide whether to add it to an existing Legend (set) or start writing a new Legend. There are two types of Legends. Level Legends (left) can include cards of the same Level, but different Families (max of 5 cards), while Family Legends (right) can include cards only of the same Family, but different Levels (max 3). You can use Citizens as wild cards to help complete a set that already has at least 2 cards in it; its transfer cost is equal to the Level of the missing card. Timing is important. The first player to complete a Family Legend, takes the matching Bonus tile worth 5 VP. The second completed Legend for that Family gets the 2 VP token. It’s possible for one person to earn both bonus tokens for the same family by completing the first two Family Legends for that Family. For each of the three Level Legends, the first player to write a 2-card Level Legend of that denomination, gets the matching bonus token. However, if someone later writes a longer Level Legend (more cards), they can steal that bonus away. Level Legends can change hands multiple times during the game until someone writes a 5-card Level Legend, which can’t be beat. To wrap up Phase III, place the Quest cards back in the Temple in ascending order. Phase IV – End of Epoch. Prepare for the next round by placing your four columns back on your player board and straightening your Activated cards in your Domain. Move the Epoch marker to the next Epoch and proceed with Awakening. Game End. The game ends at the end of the fifth Epoch. Players set aside any cards left in their Domains and any single cards in their Elysiums. You can now use the Chronos powers on any cards in your Legends to gain bonus victory points. Each Family Legend earns you 3 VP if it’s made up of 2 cards or 6 VP for 3 cards. Level Legends score 2 VP for 2 cards, 4 VP for 3 cards, 8 VP for 4 cards and a whopping 12 VP for 5 cards. If the Ares Family is in play, the player with the most Prestige Points (PP) scores 16 victory points, the next 8 VP, then 4 VP, then 2 VP. Total your scores and the player with the most victory points wins his place on Mount Olympus. “The game is over before you want it to be,” is a common comment about Elysium. The artwork, performed by eight different artists – one for each Family deck – is quite beautiful. 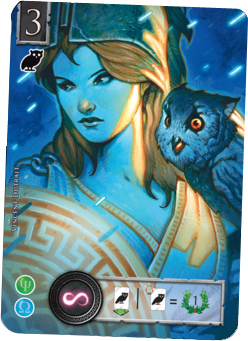 The Hades Family cards were done by the same artist who illustrated Splendor: Pascal Quidaul. 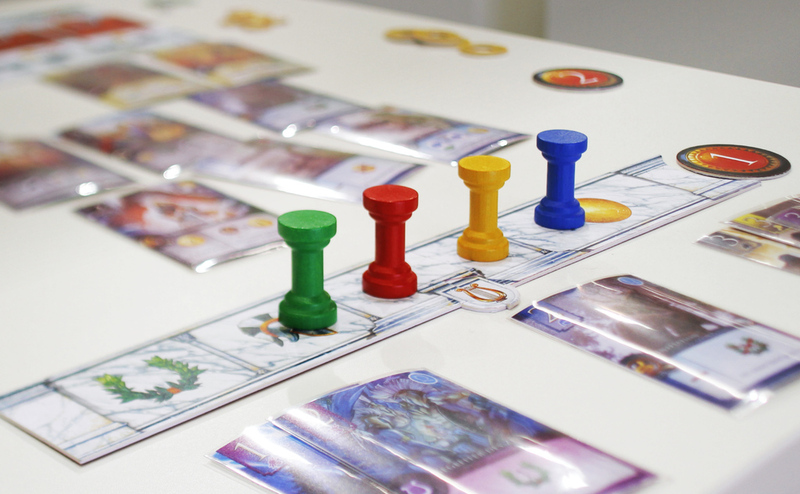 The simple game play makes teaching the Elysium quick and easy – usually in less than 10 minutes. Elysium supports 2 to 4 players ages 14 and up with a playtime of 60 minutes. Replayability is built into the game. Elysium includes eight different Family/God card sets. Each God does one thing really well. For instance, Zeus generates points, Apollo lets you draw cards, Hephaestus gets you gold.. Because you only use five Families in a game, every game will be different. 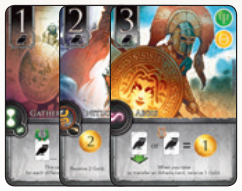 The designers suggest Athena, Hades, Hephaestus, Poseidon and Zeus for your first game. At the end of the rulebook, they’ve also suggested combinations for a high scoring game, a more aggressive game of fierce competition, a more difficult game with tight scores, a game with spectacular combos, and what will probably be my favorite, a game with alternate ways to win. Couple all this with a playtime of 60 minutes and it’s easy to see that Elysium is sure to earn the status of nobody can play just one.